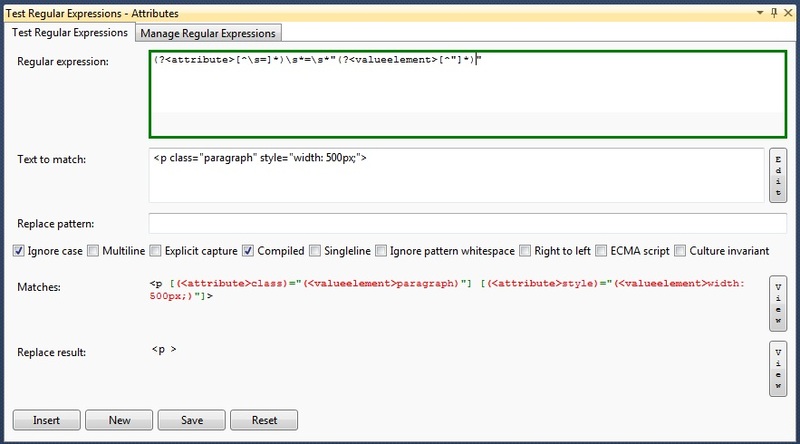 Parsing of your existing regular expressions from code for C# and VB. Instant compilation of your regular expressions as you type along with error message feedback. Matches, groups and captures highlighted in color on your input data so you get an easy overview of exactly how your regular expression matches your data. Saving regular expressions for later use. Open the Regular Expression Tester without selecting any text in the code editor. You will get an empty window, where you can start creating your regular expression with options. When you select "Insert", a statement like new Regex(@"\s*a\s*", RegexOptions.IgnoreCase | RegexOptions.Compiled) is generated. Select a string containing a regular expression including quotes - e.g. "(a*b)c" - and start the editor. Your expression will be in the regular expression field to test. When you're done, select "Insert" and the string in your code window will be updated. Select a string containing a regular expression and options - e.g. ("(a*b)c" + "d*[^ef]*" | RegexOptions.Compiled) - and start the editor. Your expression will be in the regular expression field to test and the options will be selected. When you're done select "Insert". You can save your regular expressions for later use, by clicking "Save" when you're editing a regular expression. All your saved expressions are available from the "Manage Regular Expressions" tab. Double clicking one of them in this view will open it for edit.